Looking for Cinderella props for sale? 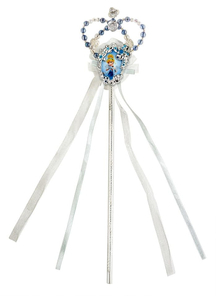 On this page, you will find all Cinderella costume props to complete your outfit. Cinderella is a classic childhood fairy tale of a young woman whose parents die, leaving her with an evil stepmother and two mischievous stepsisters. But once upon a time, the kind Fairy Godmother dress Cinderella to the ball where she meets Prince Charming. They fall in love with each other and live happily till the end of their days. There have been several movies portraying this classic tale. The last one was release in 2015 by Disney, staring with lovely Lily James. Every little girl dreams to become a princess. And the image of Cinderella is perhaps one of the most famous and popular in the whole world. Of course, this is not surprising, because this princess is famous for her extraordinary beauty, kindness, and modesty. Cinderella is an excellent role model for all the young female fans of this story. Imagine how glad will be your daughter if she wears Disney Cinderella dress. Your little girl would dance around her house in a blue dress pretending that she had mice best friends and a carriage made from a pumpkin. She would believe that all her wishes will come true. 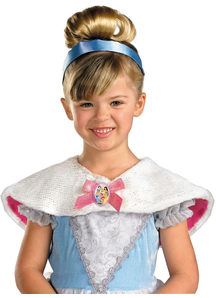 So you have chosen a Cinderella look for your beloved daughter for next Halloween or birthday party? First of all, you have to pick up the right costume. Our online store offers a great selection of best Cinderella dresses for every taste and size. Click on other pages and choose the perfect Cinderella outfit. But just the costume is not enough. You’ll have to complete your girl’s suit with some accessories, without which you cannot imagine this character. 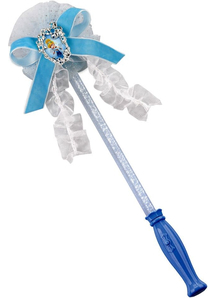 First of all, we offer a princess wand as a great complement to any Disney princess look. All the girls are crazy about fairy tales, fantasies, and magic. Buying a magic wand your daughter does not even need a suit to run around the house and say her little spells and desires. By the way, here is such a cunning plan, you could listen these desires and for the right occasion like Birthday, Christmas or New Year to make her dreams true! One more detail that could decorate Cinderella dress is a capelet. This refined and important detail will give your child a royal look. Hurry up to the magic world of Disney fairytales! To make your little princess even happier, we offer to organize a theme Cinderella birthday party, to dress up all the guests like the characters of this fairytale and to make a really royal celebration.